Pretty Lights, Avett Brothers, Modest Mouse, Trombone Shorty, Bastille, Fitz and the TantrumsÂ part of the stellar line-up announced forÂ fifth annual, award-winning Hangout Music Festival on the beautiful beaches of Gulf Shores, Alabama. Here’s the line-up we have so far, with more acts yet to be announced. .
* additional bands will be announced. Gulf Shores, AL (January 15, 2014) â€“ Hangout Music Festival organizers announce and celebrate the lineup for the fifth annual Hangout Music Fest, featuring The Black Keys, The Killers, Outkast, Jack Johnson, Queens of the Stone Age, Pretty Lights, The Avett Brothers, Modest Mouse and The Flaming Lips on the beautiful beaches of Gulf Shores, AL on May 16-18, 2014. Also included in the stellar over 75-band lineup are STS9, Wiz Khalifa, Zedd, Childish Gambino, Amos Lee, Conor Oberst, Tegan and Sara, Portugal The Man, Fitz and the Tantrums, Capital Cities, Boys Noize, Bloody Beetroots, Ingrid Michaelson, Trombone Shorty & Orleans Avenue, The 1975 and Bastille. Bands will play on six stages, including the newly added Red Bull Sound Select stage. The setting of the Hangout Music Fest is unlike any other. Fans watch performances just steps from the Gulf of Mexico and sample seafood prepared by renowned regional chefs from the newly redesigned Alabama Gulf Seafood Outdoor Courtyard. Fashion will also be in the spotlight with a village of pop up boutiques where fans can shop for dresses, bathing suits, sunglasses and more. Even romance gets a boost with the Hangout Music Festâ€™s new beachside wedding chapel. Fans will also enjoy access to extraordinary amenities including more shaded areas under palm trees, the Sky Bar tower, which offers 360-degree views of the festival, and a plethora of amusement rides and games, free refill water stations and a variety of dining options. The Hangout Music Fest is located on the Alabama coast just a few miles from the Florida border. The Gulf Shores area offers a wide arrange of vacation rentals including condos, hotels and beach houses – many of which are located within walki-ng or biking distance to the festival. Fans looking to book a place to stay for the festival can choose from a wide variety of options at www.hangoutmusicfest.com. Fans will also be able to book all-inclusive travel packages and reserve shuttle passes. The Hangout Music Fest is located on the Alabama coast just a few miles from the Florida border. The Gulf Shores area offers a wide arrange of vacation rentals including condos, hotels and beach houses – many of which are located within walking or biking distance to the festival. Fans looking to book a place to stay for the festival can choose from a wide variety of options at www.hangoutmusicfest.com. Fans will also be able to book all-inclusive travel packages and reserve shuttle passes. To get fans in the Hangout state of mind, throughout the day, MTV, VH1, Palladia, MTV.com, MTV Hits, MTV Jams and mtvU will be featuring music videos, live performances, news packages about the festival and interviews with this yearâ€™s lineup. In addition, Palladia will be airing highlights from last yearâ€™s festival from 9am-11am ET/PT and 7pm-9pm ET. MTV, VH1 and Palladia will be down on the beach again this year to present an unprecedented and all encompassing multiscreen presentation of the music, events and fans that will define this yearâ€™s festival. 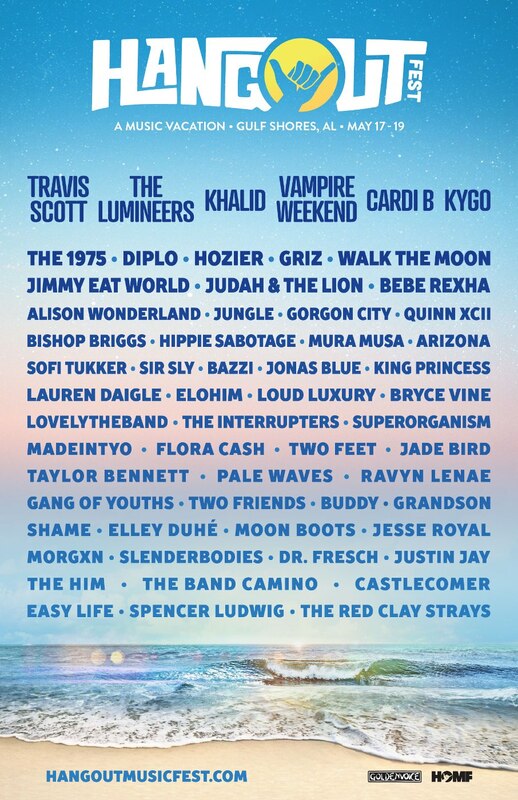 About Hangout Music Fest: The Hangout Music Festival has been recognized as one of the premiere live music events in the United States with a beach setting that is part music festival and part dream vacation. The festival is located on the white sandy beaches of Gulf Shores, AL â€“ just a short drive from the Pensacola FL and Mobile AL airports. Each year at the Hangout Festival, fans are treated to some of the biggest names in music alongside new emerging acts. The Hangout Music Fest was recognized by Pollstar as the â€œMusic Festival of the Yearâ€ in 2011 and was named as one of the best festivals of 2013 by Paste Magazine. An economic impact study, conducted by the City of Gulf Shores and Auburn University, reported that the festival brought a whopping $31 million to the local economies of Gulf Shores and surrounding areas, in 2013.